Mom surprised me with something special when I was at my parent’s house yesterday – it’s a picture of the 1947 Dodge from way back when my Great Uncle Elmer owned her (*see note below on the Dodge’s history). The picture was taken, most likely, in 1949. The Dodge is bright and shiny and my Mom’s Cousin Renny is sitting behind the wheel with a big smile on his face. It’s so cool to see what the Dodge looked like back in the day when she was almost brand new! The thing that jumps out at me the most about the picture are the wonderful tires with white sidewalls. When I showed the picture to my brother, Joel, he was excited to see that the Dodge had fog lights. We weren’t sure if the fog lights were original or added on later by my Grandpa. Now we know that they were in place back when Uncle Elmer owned the car. How did we get this fabulous picture? Well, according to Mom: Aunt Harriet is 101 years old now and lives in a nursing home (Uncle Elmer passed away some time ago). Her daughter, my mom’s Cousin Joanne, has been going through Elmer and Hariett’s things. Joanne gave a box of Elmer and Harriet’s old pictures to my Uncle Marvin. I believe Joanne passed on the Dodge picture with the intent that we get it. Marvin passed off the box of pictures to Mom knowing the Dodge picture was in the box and Mom gave the Dodge picture to me. It’s kind of a miracle this picture has been around since 1949 and it’s really a treat that it found its way to us! I was at my parent’s house the other day and stumbled upon a picture of the 1947 Dodge in Mom and Dad’s office. It’s fun to see Josephine making cameo appearances in old family photos (like she did in this pic from 1962) – and here she is again sitting quietly in the background while my big brother, Don, and I pose for a picture in the snow. The picture was taken at Grandpa and Grandma Anderson’s house in about 1979, about a year before Joel was born. I would have been almost 12 years old, the same age my son, Ryan, is now. 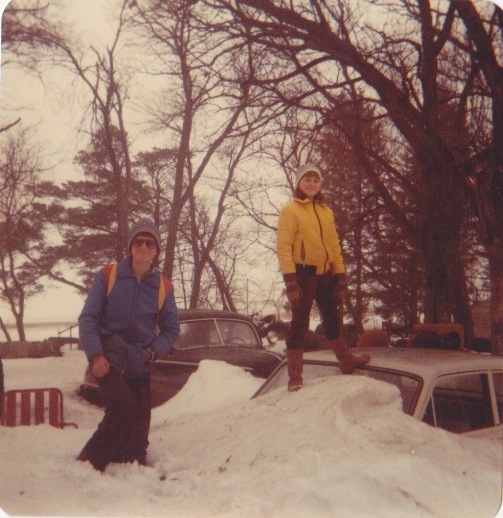 I’m betting Mom took the picture simply to show how much snow we had that winter but here we are 35 years later all excited to see the Dodge in a picture and getting all nostalgic for days gone by. Can anyone ID the make and model of the car I’m standing on? I remember the car but sure can’t remember the make and model. Donnie, do you know? And can you identify the tractors in the background? The picture is a bit of a time warp when it comes to fashion. You’ve gotta dig Donnie’s big framed glasses. Our cool hats stocking caps were one of a kind creations knit on a knitting machine (they were pretty new on the scene back in the 70s, I believe) by family friend, Joan Swanson. I remember liking my yellow coat and my cool boots. 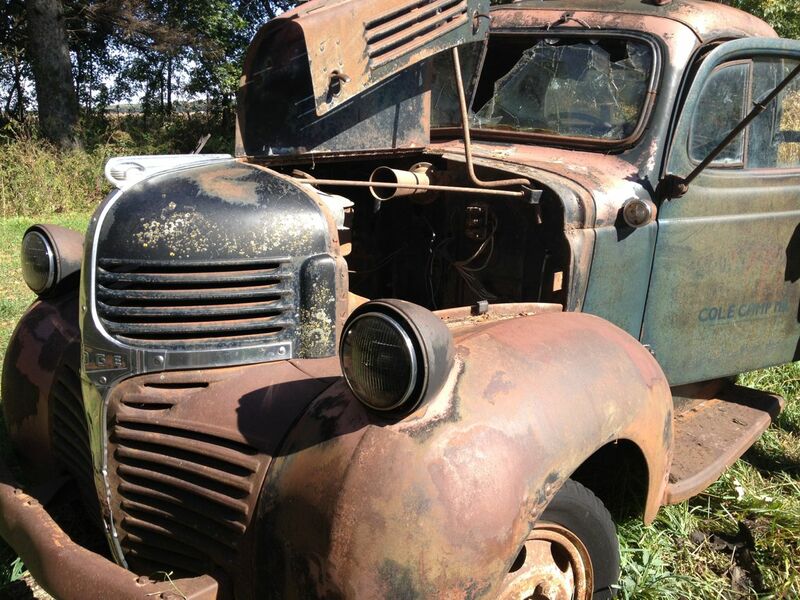 As for the latest on the Dodge – well, it’s not really running. We were hoping to drive it to Back to the 50s this coming weekend but that’s not going to happen. Oh well. There’s always next year. 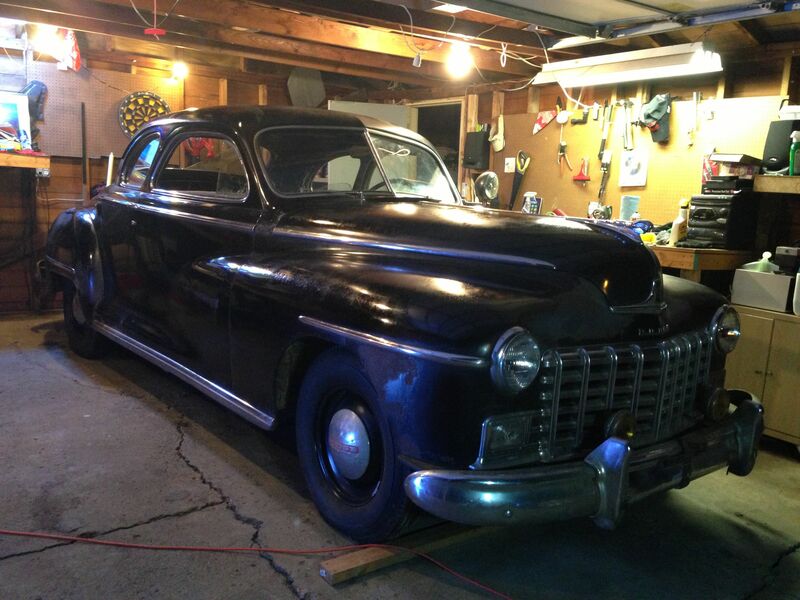 You know that article that I just blogged about, the story written for the Lonsdale Area News-Review about our little old Dodge project? I mentioned that the story was online now and was also going to be in the actual paper soon. Guess what? “soon” is now and the print story is now arriving in mailboxes in my neighborhood. I just got my newspaper a few minutes ago and started laughing, in a good way, because there’s a silly picture of me laughing on the cover of the paper along with the story about our Dodge with a slightly different heading. I’m still chuckling at the picture and am incredibly pleased with Kaitlyn Roby’s writing and how she told our story. When we got the Dodge it was immediately clear that we had an old car with character, a vehicle with stories to tell. 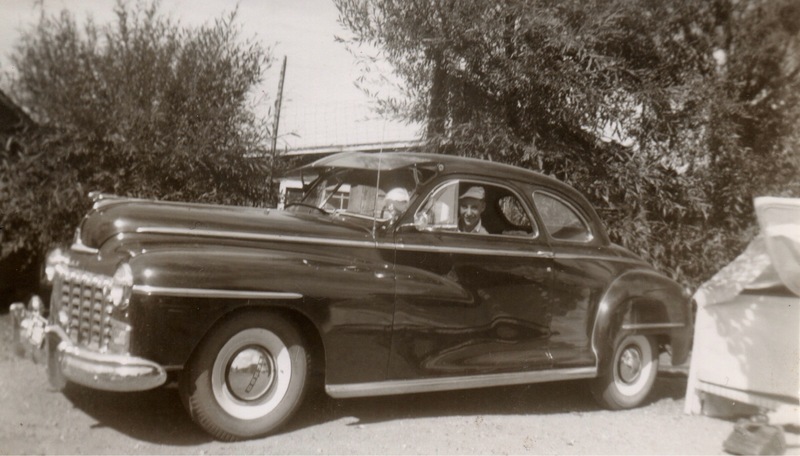 Add to that the fact that the Dodge had been in our family, a member of the family of sorts, for 64 years and it was absolutely clear that the Dodge needed a proper name other than “The Old Dodge.” Joel agreed wholeheartedly – we needed to find a name for the Dodge. But first, was the Dodge a him, we wondered, in need a guy name? Or a her? Or did the Dodge need some sort of genderless name? We’ve brainstormed and come up with several name possibilities. At first we figured we had a “guy” car so tried out names like “Howard” for our Grandpa who owned the Dodge. We thought about “Elmer” for our great uncle who owned it before Grandpa. “Manuel” also came up as a possibility and even “Marvin” for our uncle who we bought it from. None of those name quite took. So the Dodge continued on without a proper name. In the weeks that followed, it seemed that when we talked about the Dodge we were starting to call it “her” so we started thinking of female names. “Wanda” was super cool but already the name of our brother’s old Dodge truck. “Edith,” our Grandma’s name just didn’t seem right. Other names were falling flat as well. Until this morning when Joel mentioned a name that might just be The One. This morning I headed over to Joel’s with plans to go for a Dodge ride. First, though, we sat down in Joel’s kitchen and talked to a reporter named Kaitlyn about the Dodge (seriously – she called last night to see if she could write a story about the Dodge project/Dodge blog. I’ll let you know when the story runs). At one point in the interview I mentioned something about how the Dodge still doesn’t have a name. “I called her Josephine this morning when she wouldn’t start,” said Joel. (to prepare for the reporter’s visit, Joel decided to make sure the Dodge would start this morning. She wouldn’t. At first. He hooked her up to the battery charger. She started when the pressure was on and the reporter was there to take pictures of her). “Josephine? Why Josephine?” I asked, already liking the sound of the name. Joel said he didn’t really know other than “Josephine” is sort of like “Joel” and somehow “Josephine” is the name that came out of his mouth when he was frustrated the Dodge wouldn’t start. “And isn’t it some relatives name, too?” he asked. Joel was right. Josephine was the name of our Great-Grandmother, our Mom’s Grandma. Our Grandpa Howard’s Mom. Josephine. The more I say the name the more I like it. The fact that the name was our Great-Grandma’s makes it even better. Somehow it just seems right. Josephine and C.C. Anderson celebrating their 50th Wedding Anniversary. P.S. Before I drove back home today, I stopped at my parent’s house to say “hi” and to ask Mom a question about the name Josephine. When Joel mentioned “Josephine” we both remembered it was the name of a relative but couldn’t remember just which relative, though we knew she was on our Mom’s side. I was also thinking that Josephine was a middle name, not a first name. So I asked Mom just who Josephine was. “She was my Grandma,” Mom said. Moments later, I noticed a framed picture on Mom and Dad’s kitchen counter that I never remember seeing before. The man looked an awful lot like my Grandpa Anderson. 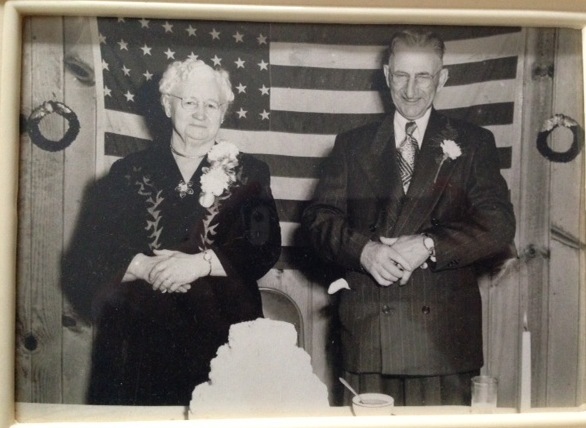 Could the picture be of Great-Grandma Josephine and Great-Grandpa C.C. ? I asked Mom. Indeed it was – the picture was of my Great-Grandparents celebrating their 50th wedding anniversary. What are the chances of finding this picture on the very day that my brother calls the old Dodge “Josephine” for the first time? Pretty slim, I’d say. But that’s what happened.